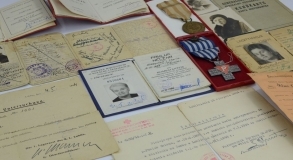 The collections of the State Museum at Majdanek were enriched with extremely interesting and valuable materials relating to Helena Pawluk née Błeszyńska, a former prisoner of the Majdanek concentration camp and the prison at the Lublin Castle. The donated collection includes documents, photographs and personal items belonging to Helena Pawluk. Her grandson, Mr. Wojciech Pawluk, is the donor. 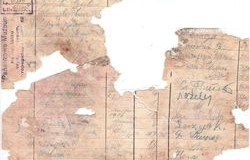 In the historical archives of the State Museum at Majdanek, there is a certain highly interesting collection, which stands out from the other materials documenting the history of KL Lublin in terms of both its form and content. The National Day of Remembrance for Victims of the Nazi Concentration Camps is celebrated on 14 June. On that day, the Polish Association of Former Political Prisoners of Nazi Prisons and Concentration Camps marks its 70th anniversary. 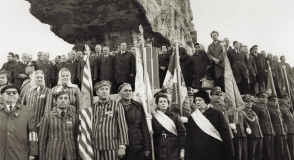 The meeting will be an opportunity to recall the activities of the Association for the inhabitants of Lublin who were repressed by the Germans during World War II. 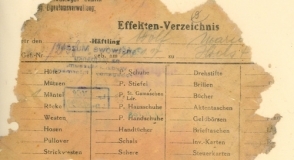 In early spring 1942, before the first mass transport of Jews from Slovakia arrived to the concentration camp at Majdanek, the camp administration received special forms for the inventory of the prisoners’ belongings, including civil clothing, daily necessities and valuables. On July 2, 1943, the camp fields filled up with hundreds of prisoners from the pacified Zamość region. There are many documents preserved that concern this group of detainees, including 64 money records. 28 of them are related to inhabitants of Aleksandrów. Agnieszka Koman, born 1904 in Aleksandrów, was marked with the highest number on that day – 15350. She was released from the camp on August 8, 1943. On June 28, 1942, Adolf Gokorsch, a 43-years-old German criminal from Vienna, was registered in the Majdanek camp. Previously, he had been detained in Dachau, where he was marked camp number 341. At Majdanek he was marked with camp number 108. 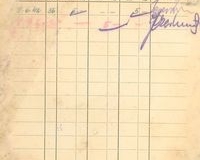 According to his money records, he – similarly to many German prisoners – made some deposits and withdrawals from his account. 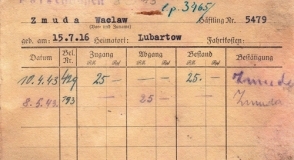 On June 9, 1942, Józef Czerwisiński (Czerkawski) from Lublin was detained in the Majdanek camp. He was marked with camp number 4737 that earlier had been given to another prisoner. He was most probably released from the camp on September 8, 1942. On June 2, 1943, 9 women from Lublin were detained in the Majdanek camp. Among them, there was Maria Wolf, born 1917, who was marked with number 12138 in KL Lublin. 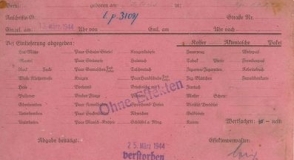 As majority of her companions in misery, she was transported to Ravensbrück on April 19, 1944. On May 22, 1942, a group of Polish prisoners from the Lublin region was brought to the Majdanek concentration camp. They were arrested in Lubartów and its surroundings, and then transported to Lublin. 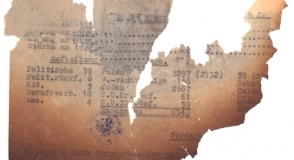 Some of prisoners were given numbers that had been used before in the Majdanek camp – e.g., Maksymilian Jałocha was given number 5426, but most of them were given new numbers above 8300. On May 15, 1944, three prisoners fled from Fahrbereitschaft Kommando from field III. They were Mikołaj Stebliński “Sasza,” Michał Nadziejko and Jan Poniatowski. 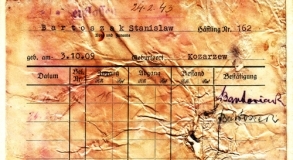 The initiator of the escape plan was “Sasza” Stebliński. On that day he received an urgent task to overhaul the commandants car. On May 11, 1944, the Soviet air force executed a bombing of Lublin. The concentration camp at Majdanek was also shelled. The first bombs hit the city at 21:30, and the bombardment of Majdanek began an hour before midnight. The raid left more than 200 casualties in the city alone but didnt kill any prisoners at KL Lublin. At the end of April 1943, a transport of people from the Warsaw ghetto, a fight-zone then, reached the concentration camp in Lublin. According to the daily records of the men camp, on the April 26, 1943, there were 12 957 prisoners in a camp. A day later the number rose up to 16 453. This means that within one day the number of inmates increased by 3496. On April 22,1944, the camp post office sent a few deliveries, money orders and parcels containing valuable objects. 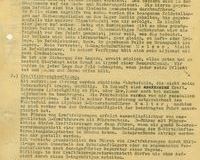 The first and third entry in the post book (entries 187 and 189) concern the shipment of valuable objects belonging to the female prisoners who were transported to the concentration camp in Ravensbrück on April 19, 1944. 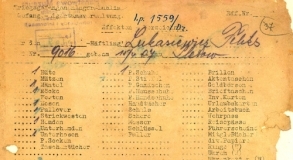 On April 10, 1943, names of 18 prisoners were registered into the record book of the concentration camp in Lublin. They were arrested in the villages of the Lublin District in. 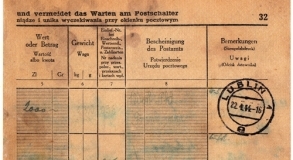 Among the detained Poles there were 11 peasants arrested on April 2, 1943, in retaliation for the shooting of a German gendarme in Kolechowice near Lubartów on March 15, 1943. 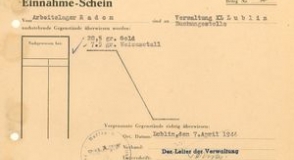 On April 7, 1944, the Head of Administration of KL Lublin, Anthon Thernes, added 28.5 grams of gold and 7.5 grams of “white metal” to the camp. These precious metals were probably taken from Jewish inmates of the camp in Bliżyn near Radom. It had been under the authorities of Majdanek since 1944. On March 28, 1943, 112 hostages from the area around Włodawa were detained in field IV of the Majdanek concentration camp. They were peasants, put in preventive custody for having murdered District Commissioner Götz and his family. Between March 23 and 26, in reprisal for this murder, German military police pacified a few villages near Włodawa, including Lubień, Wyryki-Adampol, Skorodnica and Kamień. Stefan Iwanek, born in 1919 in Lublin, was arrested on March 12, 1943, in Garbów for affiliation to the resistance movement (Bataliony Chłopskie – Polish Peasants Battalions). He was then committed to the prison in the Lublin Castle. On August 13, 1943, he was detained at Majdanek. 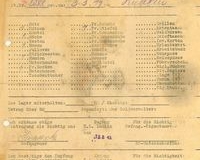 He was there given number 5288 and got assignment to Gärtnerei Kommando (garden kommando). 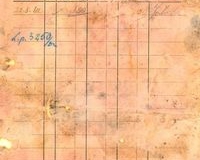 On March 10, 1943, Franciszek Papierz, Antoni Tryka and Wojciech Fronczak from Huta Stara in the Biłgoraj district were incarcerated at Majdanek. They were arrested on March 9, 1943, in retaliation for the attack on the Polish Blue Police station in Huta Krzeszowska which happened on February 27, 1943. Władysław Mularczyk (born in 1905 in Stawka) was released from Majdanek on March 6, 1943. Mularczyk arrived at Majdanek in mid-December 1942. His release form captures attention. 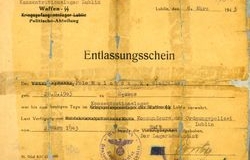 The original release form was printed on April 9, 1942, when the camp was still known as Kriegsgefangenenlager Lublin (camp for prisoners of war). On 24 February 1943, Stanisław Bartoszak, born in 1909 in Kosarzew near Bychawa, was released from the concentration camp at Majdanek. He and a group of hostages from locations between Bychawa and Krzczonów were arrested in autumn 1942. On February 16, 1943, several people were detained in the Majdanek camp. Among them there was Feliks Łukasiewicz from Pleszewo (Greater Poland), born 1907. He was marked with camp number 9016. He died on April 1, 1943. According to the camp death certificate, he died from pleurisy. 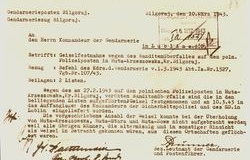 Z fragmentarycznie zachowanego dokumentu z 10 lutego 1943 r. odczytać można stan obozu męskiego, który wynosił 8340 więźniów.